Moulded one-piece extra wide frame. Latex fits onto spigots that rotate within frame arms, but doesn’t eliminate twist completely and after tests the thin latex showed signs of wear. Fold over spigot style connecters once again attach latex to pouch through eyelets but on testing one broke! The strength of the Xtra Strong ROBO Pouch is questionable and is on the small side, lending itself more towards match particle work. On tests this ’pult was extremely accurate at grouping baits and surprisingly good on distance. 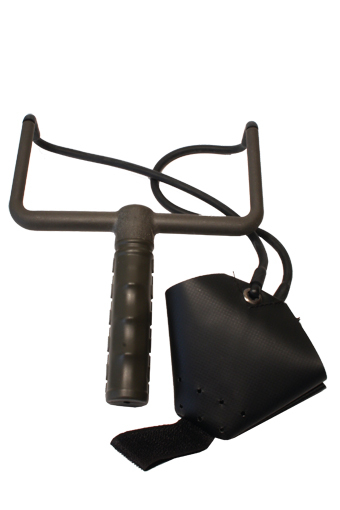 Comfortable compact ’pult with a Sure Grip moulded handle. Latex fits into frame and is secured by small plugs but unfortunately one broke on testing. 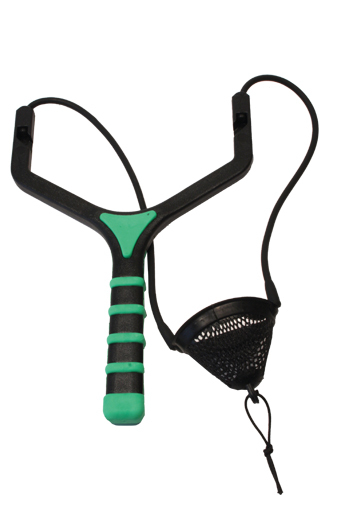 The pouch is a moulded plastic mesh style cone and is relatively small with the latex connected by spigot style connectors. Suiting the match angler more than the specialist. I found the knotted finger pull difficult to use. As good as any tested for accuracy of bait grouping and distance. Spare latex supplied. Flat handle with comfortable rubberised grip. Short but strong latex fits into recesses within the ends of the arms and is connected to both frame and pouch by small plugs and retaining rings. The pouch is on the large side but strong and incorporates an easy to use finger grip. However, it does create quite bad knuckle rap. Doesn’t create the tightest of bait grouping due to the size of the ’pult and also falls short on distance. A good ’pult for introducing lots of bait at close-quarters. Compact moulded handled ’pult. The latex connects to the frame via spigot connectors that swivel to reduce twist. Fold over strips connect the powerful latex through metal eyelets, spigot style to a medium sized flat pouch, which has the uncomfortable, knotted string style finger pull. On testing it performed well offering accuracy of group baits and distance. A no-frills ’pult but a good all-rounder and one that will withstand considerable use. A hollow soft-grip handle and ultra light but sturdy frame with latex holding points set at 90 degrees. 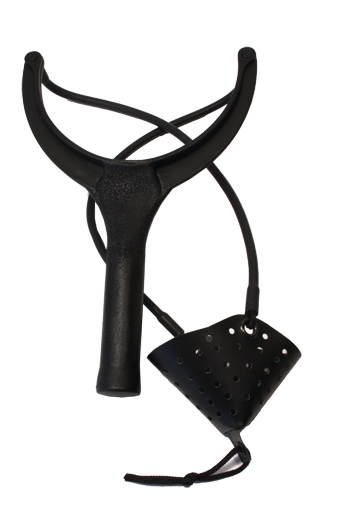 The T shaped frame removes any knuckle rap, which creates confidence in use. The latex connects to the oversized flat pouch by push-on spigots and the pouch is folded, stitched and incorporates reinforced eyelets along with an uncomfortable to use Velcro finger pull. A specialist ’pult that’s surprisingly accurate on bait grouping but the size of the ’pult reduces distance considerably. 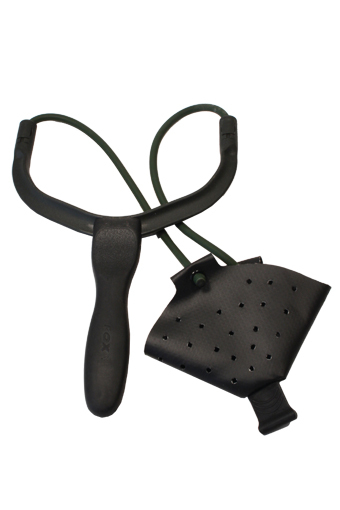 Rigid framed ’pult with a comfortable grip. 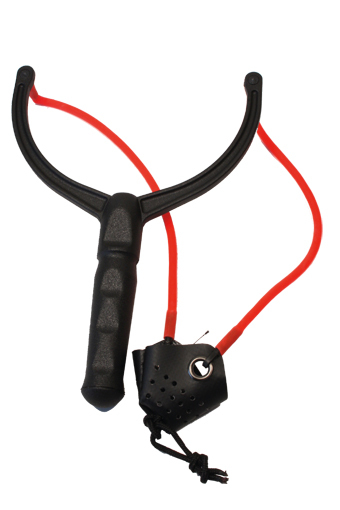 Long strong latex is connected to the pouch as well as the frame via push-on spigot style connectors and incorporates a swivel mechanism to reduce twist. Large strong flat style pouch with comfortable finger pull delivers plenty of bait relatively tightly and further than the other ’pults tested. 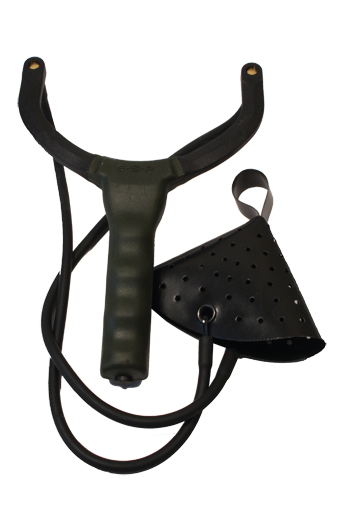 A quality made specialist ’pult that’s made to last but its drawback is that it’s difficult to use at close-quarters.